The 2018 March Plant Exchange in Oakland. Succulent cuttings have been piling up and it seems sacrilege to toss them in the compost bin. The leaning tower of stacked pots in the shed threatens imminent collapse and the leaf rake is nowhere to be found. Not to worry. The Plant Exchange is right around the corner and those decapitated aeoniums and unused pots can find a home in someone else's backyard oasis. And there will be rakes, trowels and tools aplenty to choose from. 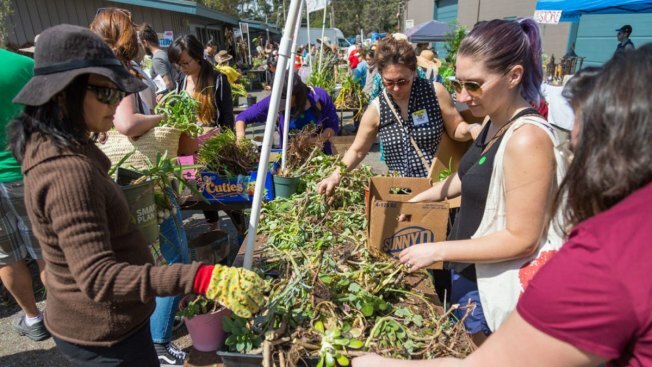 On Saturday, thousands of gardeners from around the Bay Area will gather in Oakland to exchange plants and cuttings of all kinds, from herbs to trees. Useful backyard items such as tools, mulch, compost bins and yard art will also be happily swapped. The rules are simple. "You bring some, you take some. Absolutely everything is free," said Odette Pollar, who founded the exchange 12 years ago. Some 5,000 plants, from 4-inch pots to hefty containers with shrubs and trees, are expected to change hands. The swap takes place from noon to 4 p.m. Saturday in the large parking lot of Ability Now Bay Area at 4500 Lincoln Ave. in Oakland. The Plant Exchange didn't start off as a big deal. In 2007, Pollar set up the first event in her front yard on Lakeshore Avenue in Oakland. "I really just wanted to get to know my neighbors," Pollar said, "and it worked." It worked so well that the annual event in her front yard took off, and like any happy plant, quickly outgrew its container. "The traffic was clogging the streets," Pollar said. "We had to move somewhere." First it moved to the front lawn of a local church and then to its current home at Ability Now, which donates storage space and room for other projects. "My idea to encourage recycling and reuse has blossomed," Pollar says in a video on the exchange's website that shows how the swap works. "Items that would otherwise have gone to landfills now get diverted to us, where we re-home them." The event has become more than an exchange of garden surplus. There's also food, music, vendors, exhibits and the company of fellow gardeners to enjoy. Hundreds of volunteers, including master gardeners, will be on hand to help and give advice. Pollar, however, is hoping small swaps, like her first neighborhood gathering in 2007, will still take place. "I hope people steal the idea and take it," she said. "My goal is for more neighborhoods to have exchanges with their neighbors so they get to know each other." She wants October to be established as National Plant Exchange month -- like National Night Out. The event on Saturday will be staffed by an army of volunteers and Pollar, a retired time management consultant and productivity expert, coordinates them with precision. On a recent afternoon, a box truck packed with office plants that would otherwise be discarded was quickly offloaded by a crew that showed up when Pollar put out the word that she needed help. Judith Hitchings, an Oakland resident, is one of three dozen of Pollar's volunteer "lieutenants" who spring into action to help pick up, unload and prepare for the mammoth exchange. "Who doesn't like plants, and who doesn't like something free? If you have more than you need, it doesn't need to be sitting around your yard," said Hitchings, who helped organize a variety of donated orchids, palms and dracaena. "Odette is a professional coordinator -- it's like having someone who has been in the military," Hitchings said. Some tips offered by the exchange for Saturday's event include labeling donated plants -- a form is available on the exchange website -- and to bring a box to carry back new plants. Also, organizers urge attendees not to bring pets. The Plant Exchange is a nonprofit, and hosts monthly urban gardening speaker events and supports other nonprofits and community groups by redistributing excess plants and trees to beautify neighborhoods. More information about the exchange, volunteer opportunities and sponsorships can be found on The Plant Exchange website at www.theplantexchange.com.